Heavy stars live like rock stars: they live fast, become big, and die young. Low mass stars, on the other hand, are more persistent, and live longer. The ages of the former stars are measured in millions to billions of years; the expected lifetimes of the latter are measured in trillions. Low mass stars are the turtle that beats the hare. Figure 1: An artist’s impression of a low-mass dwarf star. Figure from here. But why do we want to study the evolution of low mass stars, and their less than imminent demise? There are various good reasons. First, galaxies are composed of stars —and other things, but here we focus on the stars. Second, low-mass stars are by far the most numerous stars in the galaxy, about 70% of stars in the Milky Way are less than 0.3 solar masses (also denoted as 0.3M☉). Third, low-mass stars provide useful insights into stellar evolution: if you want to understand why heavier mass stars evolve in a certain way —e.g. 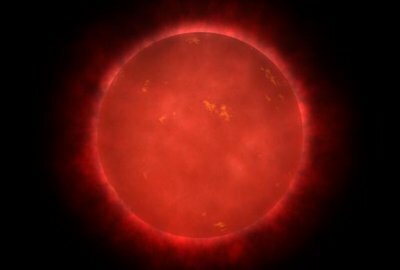 develop into red giants— it is helpful to take a careful look at why the lowest mass stars do not. Todays paper was published in 1997, and marked the first time when the evolution and long-term fate of the lowest mass stars were calculated. It still gives a great overview of their lifespans, which we look at in this astrobite. The authors use numerical methods to evolve the lowest mass stars. The chart below summarizes the lifespan of a 0.1M☉ star on the Hertzsprung-Russell diagram, which plots a star’s luminosity as a function of effective temperature. The diagram is the star’s Facebook wall; it gives insight into events in the star’s life. Let’s dive in and follow the star’s lifespan, starting from the beginning. The star starts out as a protostar, a condensing molecular cloud that descends down the Hayashi track. As the protostar condenses it releases gravitational energy, it gets hotter, and pressures inside it increase. After about 2 billion years of contraction, hydrogen fusion starts in the core. We have reached the Zero Age Main Sequence (ZAMS), where the star will spend most of its life, fusing hydrogen to helium. 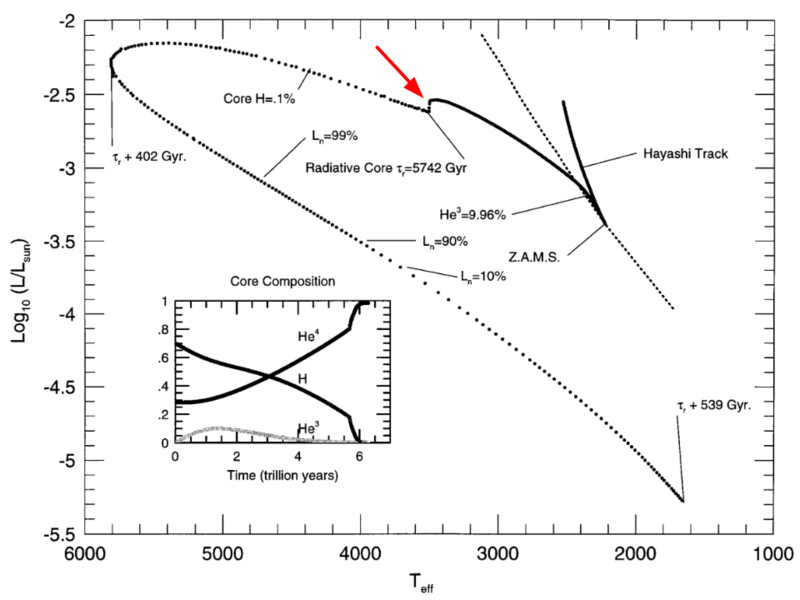 Figure 2: The life a 0.1M☉ star shown on the Hertzsprung-Russell diagram, where temperature increases to the left. Interesting life-events labelled. Figure 1 from the paper, with an annotated arrow. The fusion process creates two isotopes of helium: 3He, an intermediate product, and 4He, the end product. The inset chart plots the core composition of H, 3He, and 4He. We see that for the first trillion (note trillion) years hydrogen drops, while 4He increases. 3He reaches a maximum, and then tapers off. As the star’s average molecular weight increases, the star grows hotter and more luminous. It moves to the upper left on the diagram. The star has now been evolving for roughly 5.7 trillion years, slowly turning into a hot helium dwarf. The red arrow on the diagram marks a critical juncture in the star’s life. Before now, the energy created by fusion has been transported by convection, which heats up the stellar material, causing it to move and mix with other colder parts of the star, much in a same way how a conventional radiator heats your room. This has kept the star well mixed, and maintained a homogeneous chemical composition throughout the star. Now, the physics behind the energy transport changes. The increasing amounts of helium lower the opacity of the star, a measure of radiation impenetrability. Lowering the opacity makes it easier for photons to travel larger distances inside the star, making them more effective than convection at transporting energy. We say that the stellar core becomes radiative. This causes the entire star to contract and produces a sudden decline in luminosity (see red arrow). Figure 3: The interior of a 0.1M☉ star. The red arrow in Figure 2 marks the point where the star’s core changes from being convective to radiative. Figure from here. Now the evolutionary timescale accelerates. The core, now pure helium, continues to increase in mass as hydrogen is exhausted in a nuclear shell around it. On the Hertzsprung-Russell diagram the star moves rapidly to higher temperatures, and will eventually grow hotter than the current Sun, but only 1% as bright. Afterwards, the star turns a corner. The star starts to cool off, the shell source is slowly extinguished, and the luminosity decreases. The star is on the cooling curve, moving towards Florida on the Hertzsprung-Russel diagram, on its way to become a low-mass helium white dwarf. The total nuclear burning lifetime of the star is somewhat more than 6 trillion years, and during that time the star used up 99% of its initial hydrogen; the Sun will only burn about 10%. Incredible efficiency. Additionally, the authors compare the lifespans of stars with masses similar to the 0.1M☉ star. Their results are shown in Figure 4. The lightest object, a 0.06M☉ star, never starts fusing. Instead, it rapidly cools, and fades away as a brown dwarf. Stars with masses between 0.08M☉ and 0.16M☉ have similar lives to the star in Figure 2. All of them travel increasingly to the left on the Hertzsprung-Russell diagram after developing a radiative core. The radiative cores appear at progressively earlier times in the evolution as the masses increase. Stars in the mass range 0.16M☉-0.20M☉ behave differently, and the authors mark them as an important transition group. These stars have a growing ability to swell, compared to the lighter stars. This property is what ultimately fuels even higher mass stars to become red giants. 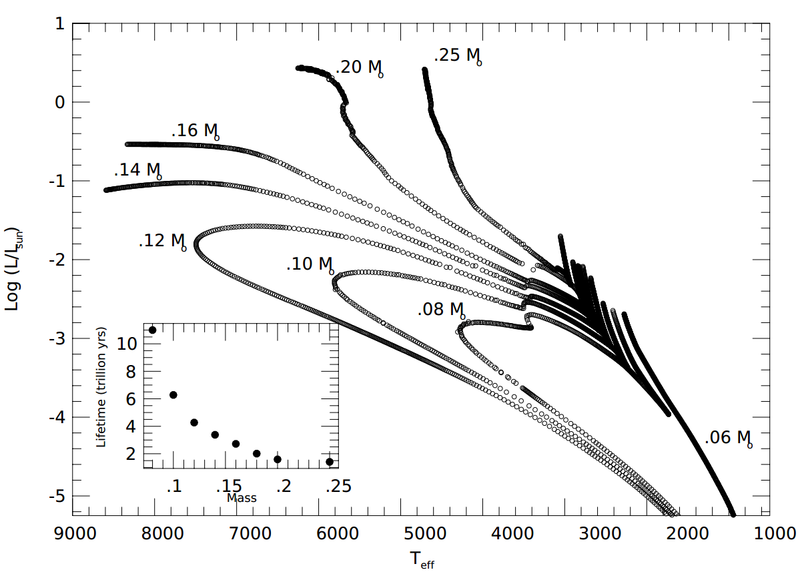 Figure 4: The evolution of stars with masses between 0.06M☉ and 0.25M☉ shown on a Hertzsprung-Russell diagram. The inset chart shows that stellar lifetimes drop with increasing mass. Figure 2 from the paper. Fusing hydrogen slow and steady wins the stellar age-race. We see that the lowest mass stars can reach ages that greatly exceed the current age of the universe — by a whooping factor of 100-1000! These stars are both the longest lived, and also the most numerous in the galaxy and the universe. Most of the stellar evolution that will occur is yet to come. What gives the 0.16-0.20 solar mass group the ability to swell? You explain that the ability to “swell” allows higher mass stars to become red giants. What actually causes the radius to expand for this type of star? What determines when the star will move to the cooling curve? Is it just temperature, or are there chemical processes at play? What allows the .1 solar mass to use up so much of it’s hydrogen compared to the sun? Is it difficult to learn about low mass stars compared with high mass stars due to their decreased luminosity? Or are they generally luminous enough that this is not a problem?